Every so often, us moms get together for evening playdates with the kiddos (without the hubbys) for dinner. Typically the host's husband is out of town and just wants some company, so the rest of us head on over there for a fun evening. This was a HUGE hit and super easy. To be honest, I actually mixed it all together in my car. Totally not weird, honest. Ok, maybe a little bit. It was one of those days where I was ALL OVER THE PLACE. This recipe says to mix it and let it chill for 4 hours, so by the time I got the ingredients I had to do it right away, but I also had to go get my daughter from preschool then head to the car dealership to fix something that was supposedly fixed 2 days ago... anyway. So I brought my cooler bag and some ice packs and prepared it in the grocery store parking lot and let it set for the next few hours. In a large bowl, mix together cake mix, plain yogurt and Cool Whip until completely combined and you see no more lumps. Cover with plastic wrap and allow to chill for about 4 hours. 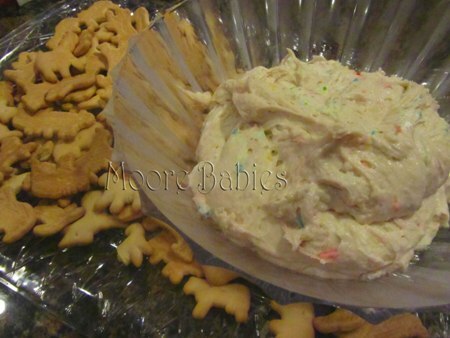 Garnish with additional sprinkles if desired and serve with animal crackers, enjoy!